Google Forms are already available long back and you can create any type of feedback forms, surveys, contact forms and anything like that. Google forms are a great way to collect information and interact with users on your blog or website. Once you have created a form or a survey, you can then easily embed them into your blog or website. Log in to your Google account and go to Google Drive. Select 'Form' from 'Create' drop down menu. You will get the untitled form creation wizard window. The procedure is straightforward and anyone can understand the options. Give an appropriate name in the form and in the next text box, write a small description about the form so that users will get more idea about the thing they are going to fill. The next thing you have to do is, create a question about your survey. Enter the question in the 'Question Title' field. You have many options for the type of answer you want to get. 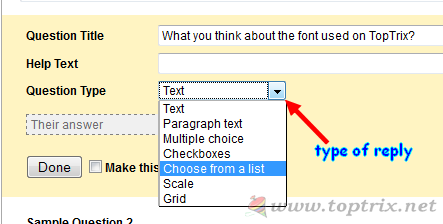 You can either select text, paragraph text, multiple choice, checkbox, choose from list, scale and grid. Text is a small text but for single sentence text, if you want a longer reply you can select paragraph text. If you want to give multiple options to choose from, select multiple choice. You can select 'Choose from list' if only one option should be selected. You can add as many questions as you want and also the type of reply and selection option. Once you have finished the number of questions, click on 'Done' button and your form will be saved. You can edit the saved form anytime though. You can add any item from the 'add item' button at top left corner. You can change the background, text type, size, color of the form from 'Theme' option available next to the 'add item' button. Once you have selected the theme, you can either share the form on Google Plus or sent the form via email or embed the form into your blog or website. To embed the form into your blog, select 'embed' option from 'More actions' button. The feedback is recorded in the excel file save with the name of the form in your Google Drive account. If you are satisfied with Google Docs Forms or you not just wanting something different, you can also try Microsoft Office Excel Surveys. Today, Microsoft released Excel surveys to all users of OneDrive. The application is specially designed for taking user surveys and allow more advanced options for creating survey forms. To create survey forms, you must have a OneDriveaccount. You can also use any other account of Microsoft services like Outlook, Live or Hotmail. 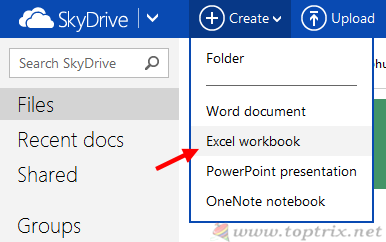 Once you log-in to your SkyDrive account, click on 'Create' button in the top navigation bar and select 'Excel Workbook' option. Give an appropriate name to the workbook and save it. This will open a new Microsoft Excel Web App. Select 'Insert' menu in menu bar and select 'Survey' button in the insert ribbon and then 'New Survey'. 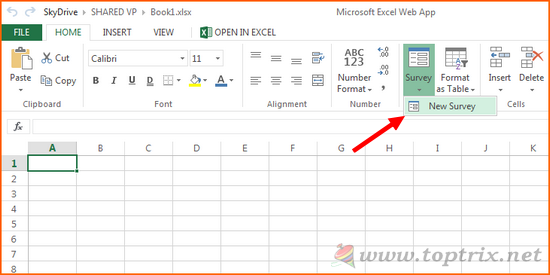 A new Microsoft Office Web App Excel survey creation wizard will open. 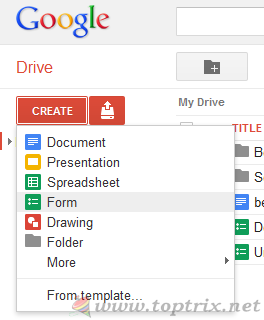 It is more or less similar to Google Docs Forms and the options are similar. Give a title to the form and enter a small description about the form. In the question field, enter your question. When you click on the question, more customization options about question will open. Here, you have to enter details about the question. You can write more description about the question. Select the type of response you want. 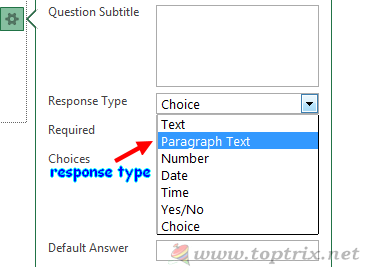 You can either select from options like text, paragraph text, multiple choice, number, date and time and Yes / No. The layout of the form will change as per the type of response you select to have. You can add as many questions as you want. Once done, click on 'Share' button if you want to share the survey via a link. You can send the link to email address. SkyDrive also offers you to shorten the long link for easy sharing. If you don't want to share the form you can straightway save the form. Click on 'Save and View' button. 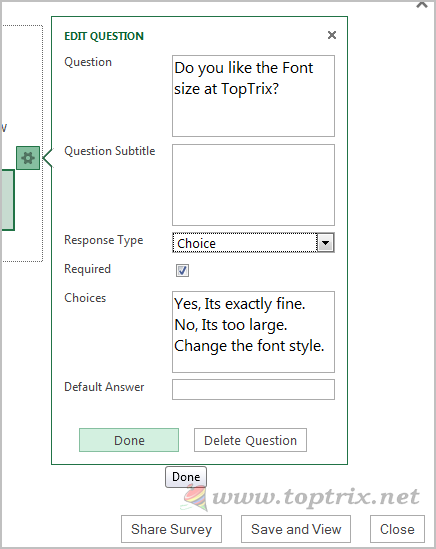 The look and customization options of Excel survey form are great but I didn't find any option to 'Embed' the form on my blog. Do you find it. I have to send the link to take the survey.